“Noise” featured exhibits by Tabatha Andrews, Art & Language, Charles Babbage, Stephen Baker, Joe Banks (Disinformation), Richard Barbrook and HRC, William Bateson, Evgen Bavcar, Patrick Blackett, Jerry Brotton, Soraya de Chadarevian, Adrian Cussins, John Dee, Umberto Eco, Manuel Franquelo, Peter Galison, Joy Garnett, Merrill Garnett, Joseph Grigley, Roger Guillemin, Sebastian Guillié, Mercurius van Helmont, Lynn Hershmann, Jeff Hughes, Margaret Watts Hughes, Lisa Jardine, Bill Jones, Athanasius Kircher, Bruno Latour, Malcolm Longair, Mike Lynch, Paul Miller (DJ Spooky), Gracie Ngale Morton, Iwan Morus, Sven Nebel, Joseph Nechvatal, Ben Neill, Roy Porter, Marc Quinn, Jonathan Ree, Michael Rees, Giles Revell, Kathleen Rogers, Romandson (Antirom), Brian Rotman, Tom van Sant, Lillian Schwartz, Nicola Schwartz, Robert Shannon, Ludwig van Siegen, Julian Simmonds, Paddy Japaljarri Sims, Bessie Nakamarra Sims, Brian Cantwell Smith, Luc Steels, Bruce Sterling, Josue Tanaka, John Tchalenko, Dave Tovee, John Tresch, Burhan Tufail, Stan Vanderbeek, Catherine Wagner, Piers Wardle, Peter Weibel (ZKM), CTR Wilson and John Wilkins. 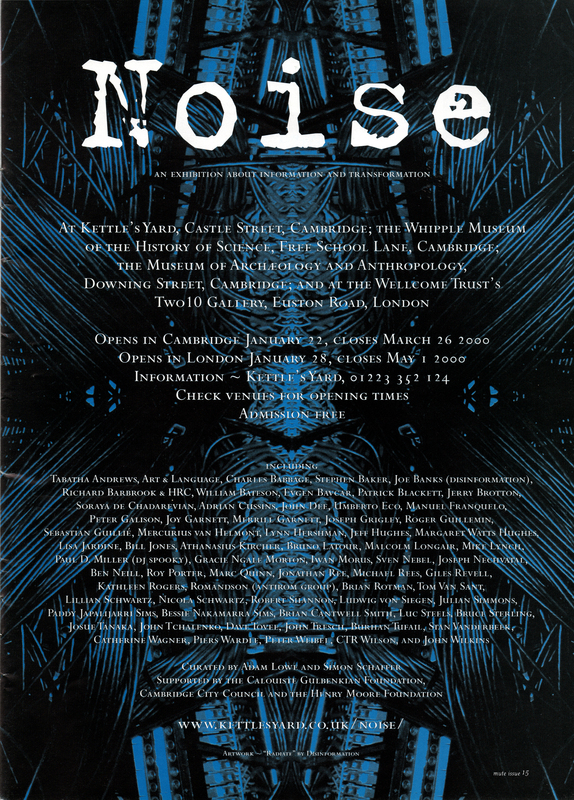 “Noise” exhibitions ran simultaneously at 4 different venues – at Kettle’s Yard, at the Whipple Museum of the History of Science, and at the Museum of Archaeology & Anthropology, all in Cambridge, and at the Wellcome Trust gallery in London. The “Noise” exhibition was supported by the Wellcome Trust, by the Calouste Gulbenkian Foundation, by the Henry Moore Foundation and by the University of Cambridge. The advertisement was designed by Joe Banks, featuring a montage that also appears on the cover artwork for the Disinformation “Sense Data & Perception” CD and on the “Rorschach Audio” book jacket. The advertisement appears on page 7 of Mute magazine, issue 15, January 2000 (alongside features by Hari Kunzru and Tom McCarthy). Thanks to Colin Banks, Georgina Brett and Simon Worthington. Umberto Eco, Paddy and Bessie Sims, Piers Wardle and Michael Harrison RIP. Check back soon for more information on the “Noise” exhibition.